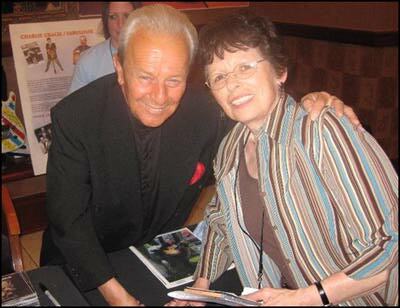 Marilyn Burger had a dream of hers come true: she met her long-time favorite singer, Charlie Gracie. The�music-loving Wisconsin�grandmother, a breakfast hostess at the Hampton Inn in Green Bay, Wisconsin, was overheard singing snippets of the Charlie Gracie hit, "Ninety-Nine Ways." Upon learning that Marilyn was a long-time Charlie Gracie fan, John, a member of the Charlie Gracie Street Team, offered her the opportunity to meet Charlie�at the Rockin' 50s festival at the Oneida Casino after his concert. She was delighted and readily accepted. Marilyn showed up at the performance venue before Charlie's concert (she was early!) and was given a tour of the Rockin' 50s area, featuring vendors of rare records and vintage 50s clothing. Thanks to�assistance from representatives of the Rockabilly Hall of Fame, Marilyn was able to join the audience during Charlie's high-energy concert. Reliable sources saw her boppin' to the beat and singing along as Charlie performed his hits, with the able backing of Germany's Mellow Men. Marilyn was one of the first people in the autograph line, clutching her new Charlie Gracie CD.� Charlie greeted her warmly, and upon learning about her long-time devotion to his music, posed for�this photo with her, which will be posted at the Hampton Inn. Marilyn is now a minor celebrity around the Hampton Inn! Reached two days later, Marilyn admitted she has played her new CD many times. "I was so thrilled," she said. " He was so gracious. I am very grateful to his family, the Street Team�and the Rockabilly Hall of Fame for making this possible. And," she added, " He certainly is a wonderful entertainer."